You know this guy, right? 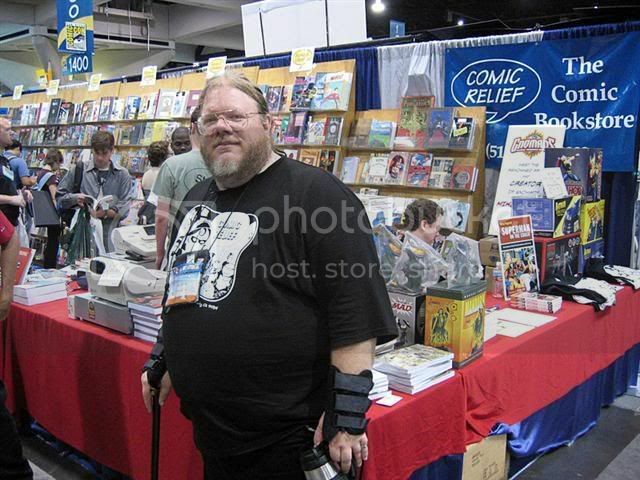 The Comic Book Guy from The Simpsons. He is the proprietor of the comic book shop, The Android’s Dungeon & Baseball Card Shop. 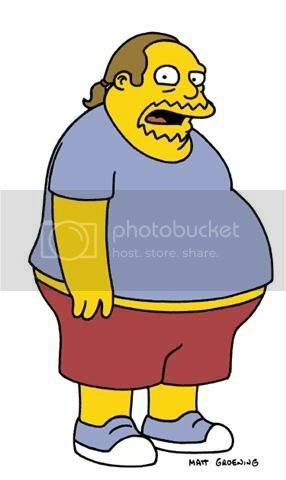 Voiced by Hank Azaria, the obese, nerdy, hairy Comic Book Guy is perhaps best known for his sarcastic quips. Now meet Rory Root, the pleasantly-plump, nerdy, hairy and mildly-sarcastic proprietor of Comic Relief, a 20-year-old, award-winning, mega-comic book store in the Bay Area. Rory has been pretty high-profile in the comic book world for a long time… I wouldn’t be surprised if he was the inspiration (even subliminally) for the Simpsons character. What say you? Separated at birth? UPDATE: I just received the sad news that consummate good sport Rory Root has passed away. You can see his comments below this post. Maybe not twins, but definitely close blood relatives. I would also nominate Harry Knowles from Aint it cool news for separated-at-birth consideration. He also bears a distinct resemblance to CBG, and CBG’s behavior in the last decade or so has been mirroring HK’s – blogging reviews in movie theaters, etc. etc. I don’t know, but Happy Birthday, Great White Snark. Nah,when I first met Matt long, long ago I was quite a bit thinner and beardless. And I generally avoid ponytails, just at conventions were it can get just a bit warm on the floor. And while I can be a tad sarcastic at times; I actually like helping customers find the right book for them. I think Nickolai is right… Harry Knowles is much more convincing as the inspiration for CBG. If it makes you feel any better, I’ve been compared to a combination of Fred Savage and Will Wheaton. Stereotypes are painful when there’s so many damned examples to substantiate them, aren’t they? By the way, I’m always awed by Comic Relief’s showings at various conventions. The effort that goes into setting up your “mini stores” on the convention floor boggles my simple mind. I would stake you closer to the Will Wheaton side of the spectrum. Though I know you’ve been desperately trying to claw your way to the Fred Savage side. HA. Nickolai wins today’s too-clever-for-his-own-good prize. My team puts forth an amazing effort to get those booths set up right. Thanks for noticing. My only real complaint with the CBG stereotype is when folks assume I’ll live down to it. I hear you. No one likes to be pigeon-holed. Unless we’re talking about “Pigeon Hole”, the game of chance on the 3rd level of the Power Exchange in San Francisco. In that case… to each their own. Anyway. Stereotypes–while they might be fun to throw around for the sake of getting a unabashedly cheap laugh in a blog post–are, of course, rarely true once you actually get to know the party in question. So, thanks again for stopping by. I think it may have hurt Rory’s feelings in some way, but now that he’s gone it can’t hurt. He was an awesome guy. The gag of comic book guy doesn’t capture his true kind spirit. He was a great man. personally I think they look a lot alike and Rory’s statement of he can be a TAD bit sarcastic HA HA HA i’ve know him my whole 49 young years he has always been quick witted and sarcastic but good naturedly of course [sorry RDR] but as a Root I am entitled to my own opinion [little family joke there] boy you guys should have been around for the lively LOUD discussions between Ivan[deceased older brother in 92] my god they could talk?? for hours. and yes his death came as quite a shock to us all he will be sorely missed and floating around up there….. NO WAY he is soaring !!!!!!!! I’ve known Rory since he worked in one of the two comic book stores on Telegraph Ave in the 70’s (the one below Dwight) and I don’t remember him ever putting me down or putting others down (unlike Comic Book Guy). He was always friendly and kind; I’m going to miss him a lot. For what it’s worth: Comic Book Guy was based on a dealer that someone from the show — probably but not necessarily Matt Groening — saw at SDCC a couple of years before the show launched. Me, Rory and the Stikman worked for the Dreaded (#@$#$%^&(*)^%$#@) in the early days, when he’d just broken up and was breaking out of his chrysalis. He was a good, loyal friend for over 17 years, and, yes, maybe he was the inspiration for Comic Book Guy, but I remember a large soul w/ a great sense of humor who enjoyed a horrible pun and almost single-handedly supported the coffeeshop next door. Save a seat at the table for me & S., Bro. Sloth Love Chunk. Chunk Love Entertainment Law. The Karate Kid Reunion: Better than your high school reunion.